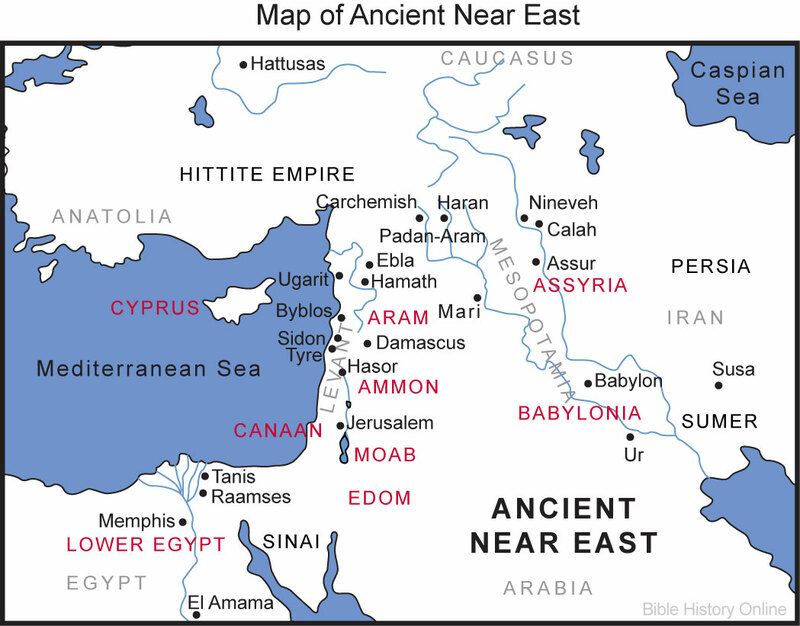 The ancient Near East was imbued with religion. There was simply no way the ancient author of the first eleven chapters of Genesis (assumed to be one person for convenience) could ignore them. Indeed, he absorbed or breathed and filtered those religious ideas from his surrounding religious culture. Direct borrowing is not always clear, but indirect borrowing is. Let’s first allay some fears before we examine the evidence for parallels. This fear appears often in the hearts of devout Bible readers. Parallelophobia literally means “fear of parallels.” It is an odd (and humorous) term, so let’s figure it out and apply it. For Gen. 1-11, the term means an irrational fear that says that if there are parallels between Scripture and the writings in the ancient Near East, then somehow Scripture is not inspired and infallible in the truths it conveys. Parallelophobia is an irrational belief that says inspiration and infallibility of Scripture requires that Scripture must have been written in an insular, isolated bubble. This fear compels its victims to forget that God inspired some New Testament authors to actually quote pagan authors, to convey his truths: Acts 17:28; 1 Cor. 15:33; and Titus 1:12. Here’s how we can apply the term, next. This one is about you and the author of Genesis 1-11. Let’s imagine that you write up a book proposal on the topic of religious narrative ideas circulating around America in the nineteenth century. Let’s imagine that you did not include the popular miracle story about a resourceful, God-favored family of survivors in the Great Mississippi Flood of (pick a year). Your agent will tell you to include the story. No publisher would accept the book without it. In your chapter on this miracle story in the Mississippi flood, he would even tell you to explore the religious aspects of Mark Twain’s novels, who wrote about life on the Mississippi. If you did not, the agent would not take you seriously and might even drop you from his client list. In the same way, the author of Gen. 1-11 simply had to cover popular stories circulating in his day. Today we call them myths because we do not believe in many gods and the strange behavior of them and goddesses and the men and women described in those stories. [ii] (Today atheists and hyper-skeptics call much of the Bible a myth because they don’t believe even in one God!) The ancient author of Gen. 1-11, though he did not use the term myth in his writing, also believed the gods in his religious culture were at least odd and needless and even ridiculous characters as they fought and squabbled and panicked and committed immoral acts, for he was clearly a monotheist. [iii] But the biblical author must have liked the stories in general terms. However, all he had to do was transform the ideas and images and religion to fit in to calm, unconfused, moralistic, relational, and streamlined monotheism. At the same time, the author purged the false gods and the deficient and strange ideas that flowed from polytheism. One last encouragement before we get to the evidence: even though the Reformers of the sixteenth century could not enjoy the textual discoveries done in the ancient Near East in the nineteenth century and currently, they instructed us to follow the historico-grammatical method. This post does exactly that. Prof. Hoffmeier maintains that the author of Gen.1-11 did not directly borrow from the Epic of Atrahasis, but Gen. 1-11 independently reflects the memory of the same events. Also, Gen. 1-11 was written in opposition to the Mesopotamian Atrahasis tradition. The Bible intends to defeat polytheism and other quirky beliefs of the Mesopotamians with monotheism and God’s straightforward streamlined and moral relationship with humanity. However, here’s a question: How could either ancient author, Hebrew or pagan Mesopotamian, know about pre-historical events when they happened thousands of years before either one lived? Neither the biblical author of Genesis nor the Mesopotamian authors could do proper historical research in the normal sense of the terms, like Luke did for Luke-Acts. So Gen. 1-11 are–and must be and can only be–free interpretations. Though I object to the “magic trees” (on the right, third row), I have to say that if there is no direct borrowing, then the author of Genesis breathed the religious air that was thick with the same ideas floating around in the Mesopotamian world. Harlow writes that the first eleven chapters of Genesis are “paradigmatic and protohistorical—imaginative [distinct from mythical] portrayals of an actual epoch in a never-to-be-repeated past that also bears archetypal significance for the ongoing human situation” (p. 182, emphasis original). Whether one interprets Gen. 1-11 as divinely inspired stories or divinely inspired theological history, one cannot deny the parallels. It is not probable that the author of Gen. 1-11 borrowed or copied directly from a variety of sources at the same time, but the elements were just part and parcel of a good ancient story. The clearest difference between all those writings and Gen. 1-11 is streamlined, authoritative monotheism. The Creator God of the Bible is large and in charge, without confusion or multiple points of views from different gods. Harlow again reminds us that Gen. 1-11 is not a myth, but it is a divinely inspired story, in the same way that the parables of Jesus are divinely inspired. However, even if you conclude that the first eleven chapters are straightforward theological history, you cannot fail to observe the borrowing, if only by the author of Genesis breathing in the “cultural, cognitive air”[ix] and not directly borrowing from Adapa. The author of Gen. 1-11 accepted a few elements but injected his account with calm, unconfused, relational, moralistic, streamlined monotheism. The Gilgamesh story includes a flood, which was inserted into the epic in the latter part of the second millennium and was adapted from the Epic of Atrahasis. [x] The hero in the flood section of the Epic of Gilgamesh is named Utnapishtim. He is the Noah-like figure. Despite these numerous parallels, there are differences. The gods destroyed people because they were noisy, while God destroyed humanity for its lost morality. The gods conceal their plans, while God tells Noah to preach warnings. When the floods came, the gods panicked, while God did not. Utnaspishtim left the boat on his own accord, while God summoned Noah from the ark. Utnapishtim was promised immortality, while Noah died like the rest of humankind. 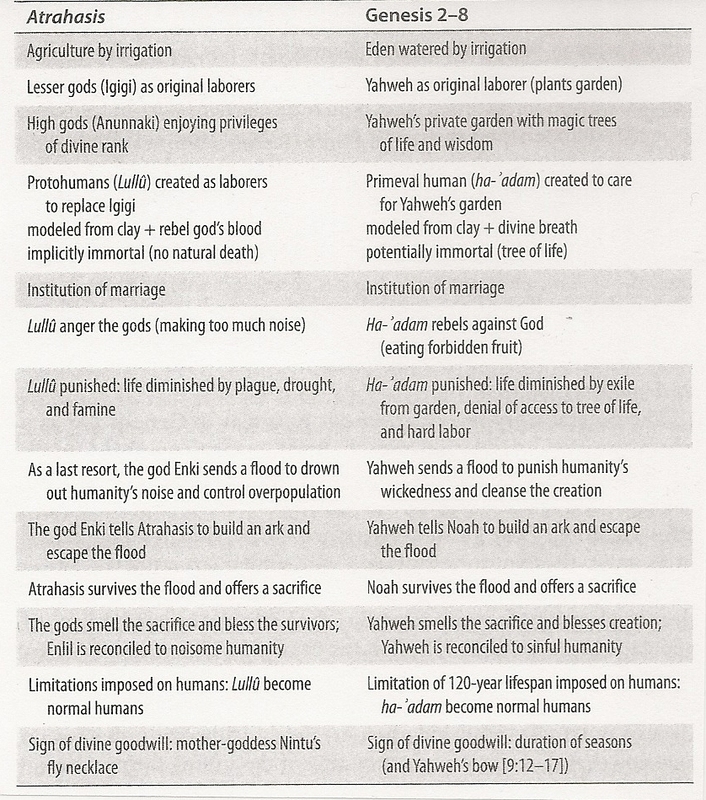 Even with these differences factored in, if the author of the flood story in Genesis 6-9 did not borrow directly from the Epic of Gilgamesh (or its sources), then as noted, he must have breathed in the extra-thick “religious and cognitive air” of the ancient Near East. In the biblical account, no one exceeds 1000 years, an indication that Scripture refuses to accord deified status to humans. It is clear that there is no direct borrowing in this case, but the primeval humans living long lives must have been in the “religious, cognitive air” that the author of Genesis absorbed and trimmed to manageable proportions. The Sumerians offered and sustained monarchy. In contrast, the author of Gen. 1-11 says all of humans are created in God’s image and are his royal representatives. These parallels do not take away from the inspiration and infallibility of Scripture in the truths it affirms. The moment the ancient author started writing, I believe the Spirit inspired him, and his writing became infallible. Whether you (the reader) conclude that Gen. 1-11 is divinely inspired theological history or just divinely inspired theological stories, the author of Gen. 1-11 borrowed, if only indirectly, from his times and religious culture. It is realistic to expect him to do this. But he transformed the stories he inherited to fit in to his chapters whose foundation was ethical monotheism. The transformation and filtering of the older polytheistic stories was vital. The differences between monotheism and polytheism are stark. God does not squabble or fight for territory and authority, while the gods do. God alone is the Creator, large and in charge and in control, while the gods are creators of sorts and the creation account seem too busy and jurisdictional–gods fight over and for territory. God has clear morality and expects humans to behave (though they often don’t), while the gods’ morality is less clear, and they and humans indulge in all sorts of shenanigans. God seems to care for people, especially when he told Noah to preach warnings of impending judgment, while the gods withheld their planned judgment. To an Old Testament nonspecialist like me (but someone who is trained to interpret religious texts), it is clear that the ancient Mesopotamian pagan authors used narrative and poetic narrative as the dominant genres, and so did the author of Gen. 1-11. Stories are more effective in reaching people than a list of propositional truths strung together in a series of sentences or than a list of laws. Today, stories are certainly more popular than boring theology or law textbooks. It is easy to imagine the same was true in the ancient world. History comes from the Greek word historia, meaning investigation or inquiry. The events happened and the persons lived so far back in time that the ancient author of Gen. 1-11 could not—nor could the other Mesopotamian authors—actually investigate them. They are free interpretations of what possibly happened in primeval, primordial times. In contrast, the New Testament authors could and did investigate the events and persons involved in Jesus’ life, teaching, ministry, and resurrection. The historical method was actually followed and true history produced (Luke 1:1-4 and 1 Cor. 15:3-8). So we do not need to believe the anxious claim that if we do not interpret Gen. 1-11 literally, then we cannot consistently interpret Christ’s life and resurrection literally. In contrast, the author of the Gen. 1-11 could not do proper historical research in the normal sense of the words, since he lived thousands of years after the events and persons in question. However, the stories in Gen. 1-11 may reflect some kernel or small nugget of traditions handed down from primordial, proto-history, like a local flood. Regardless, the bottom line for me is that we must keep a “loose interpretational grip” on Gen. 1-11. This “loose grip” is the opposite of unbending and narrow ultraliteralism, as if those chapters could even be straightforward history. Repeat: how could they be, when the author could not investigate the events and persons in question (and nor could the other authors in the ancient Near East)? Scripture is inspired and infallible. Our interpretations are not. How this works out for me in dialogue is this. Let’s say an honest and intelligent skeptic scoffs at the first eleven chapters of Genesis. I tell him they are divinely inspired stories with some proto-history thrown in the mix. Or they might be divinely inspired stories with no historical root because the author could not investigate events and persons so far back in time. In that case, they are inspired just like the parables of Jesus are. Either way, the basic theological truth in those ancient stories is that Creator God cared for humans and led them out of the primeval past. He was their judge and savior. He loved them, but also had moral standards—the flood shows this. Even today, God has all those qualities. [i] But these quotations do not mean the New Testament authors endorse paganism, which is not God’s truth. [ii] An academic at a secular or Christian university may object to the word “strange,” but when one reads Gen. 1-11 next to the mythological writings, the former appear streamlined and straightforward and moralistic, while the latter really do “feel” wilder, emotionally charged, childish and morally confused. [iii] Even the “heavenly council” that is alleged to reside in the plural “let us make” simply means angels, as the rest of Genesis assumes, or it refers to the Trinity, as some Christians believe. [iv] Isaac Kikiwada and Arthur Quinn, Before Abraham Was: A Provocative Challenge to the Documentary Hypothesis (Abingdon, 1985). [v] James K. Hoffmeier, “Genesis 1-11 as History and Theology,” in Charles Halton, ed. Genesis: History, Fiction, or Neither? Counterpoint. (Zondervan, 2015), p. 52. [vi] Daniel C. Harlow, “After Adam: Reading Genesis in an Age of Evolutionary Science.” Perspectives on Science and Christian Faith 62, no. 3 (Sep 2010) 179-95. 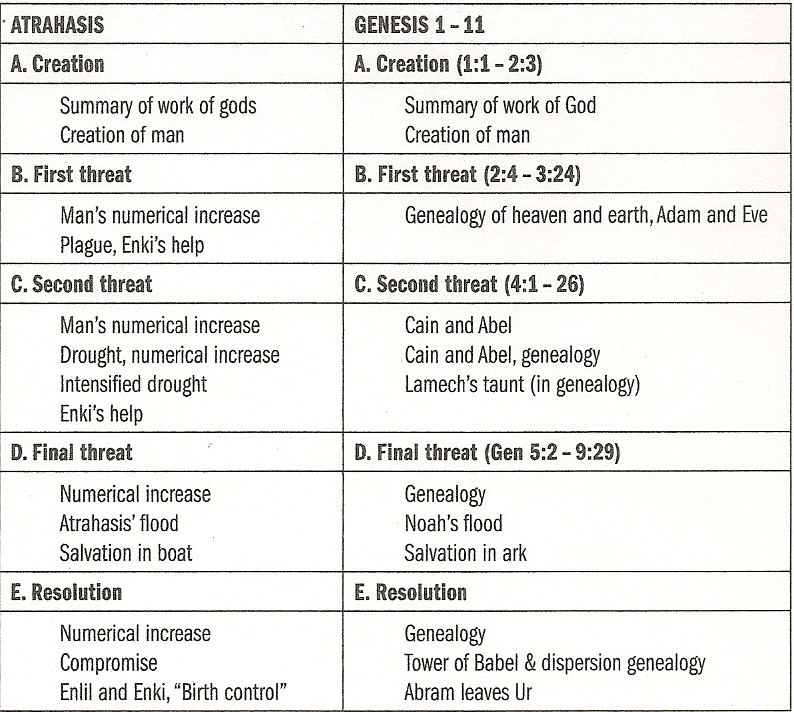 Peter Enns incorporated the table in his The Evolution of Adam: What the Bible Does and Doesn’t Say about Human Origins (Brazos, 2012), p. 54, from which the table was taken. [vii] Peter Enns, p. 55.The literature: Enki and Ninhursag; Epic of Gilgamesh; Epic of Atrahasis; Instructions of Merikare (Egyptian); Ewe and Wheat; The Myth of Adapa; Dumizi and Enkimdu; Sumerian King List. I slightly edited the elements. [ix] John H. Walton, The Lost World of Genesis One: Ancient Cosmology and the Origins Debate (InterVarsity, 2009), pp. 16-17. In his book he argues that the author of Gen. 1 incorporated the ancient motif of a cosmic temple, yet another borrowing from his religious surrounding, though not covered here. [x] Peter Enns, p. 47. I slightly adapted it. [xi] Victor P. Hamilton, The Book of Genesis: Chapters 1-17 (Eerdmans, 1990). This entry was posted in Bible and Theology, World Religions and tagged Genesis 1-11, Genesis 1-11 in historical context, Genesis 1-11 in religious context, Interpreting Genesis 1-11 by james malcolm. Bookmark the permalink.